nb AmyJo: Sailing and AmyJo has a new crew member. Sailing and AmyJo has a new crew member. Last weekend we took our daughter Amy, her dog Buddy and her dinghy down to Aldeburgh for the national Classic dinghy weekend. Her dinghy, a Lazy E, is the only one left in sailing condition in the UK that we know of. 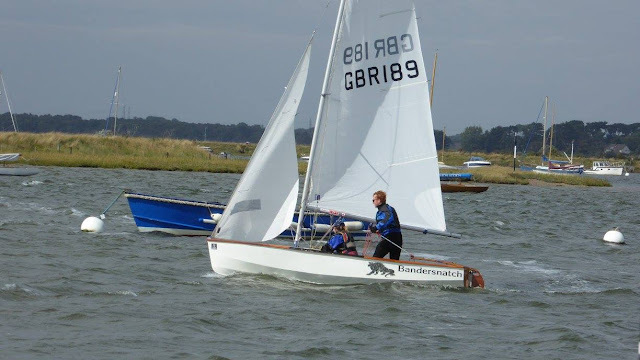 The Classic Dinghy association invited Amy to the event when they found out about it and it generated a lot of interest whilst it was being sailed at the event. 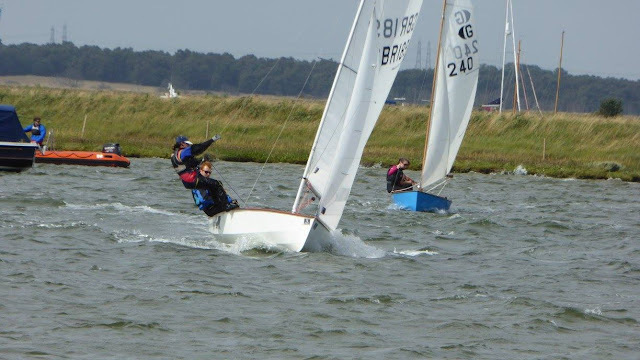 We all camped on the sailing club grounds and had a super weekend sailing although at times the wind was too strong for us to get on the water. The Lazy E is the bigger brother of the Enterprise dinghy. Both designed by Jack Holt. Sadly the Lazy E was not a popular class as it was launched at the time Glass Reinforced Resin (GRP) was becoming a popular building material for dinghies making them cheaper and more maintenance free. Jack Holt refused to believe in GRP and so not many Lazy Es were built and sold. We know of only 220 built in the UK in total which is a shame as its a fantastic boat to sail, still keeping up with many of the modern wizzy boats of today's era. On Monday I drove down to Carmarthen to pick up AmyJo's new crew member. Now I'm retired we felt another crew member would be of benefit to us. He is an 8 week old PatterJack puppy (Patterdale Terrier/Jack Russel cross) who we have called Smudge. Playing with all his toys which he has loads to keep him occupied. Smudge is settling in well and already runs around the boat as if he owns it. He is an affectionate little fellow but has a boisterous streak in him just as any puppy would have. We have to contend with bursts of playfulness and running around followed by quite sleepy periods. Its going to be interesting having him aboard thats for sure! Smudge is lovely can't wait to meet him.